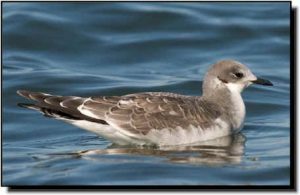 Comments: Sabine’s Gulls nest in marshy areas of the arctic tundra and winter in subtropical and tropical coastal areas off South America and Africa. Breeding adults have black heads, yellow-tipped black bills and black legs. In flight, all ages show a unique wing pattern with dark primaries, large white triangles on the trailing edge of each wing and a gray or brown triangle across the back. Great Plains observations are of single birds or small flocks during fall migration. Sabine's Gulls occur in small numbers or are found only in localized sites within the Great Plains.